Participation of all activities within our community broadens our footprint and brings the Christian message to all locals and visitors. Note the driving shed for horses and buggies to the left. 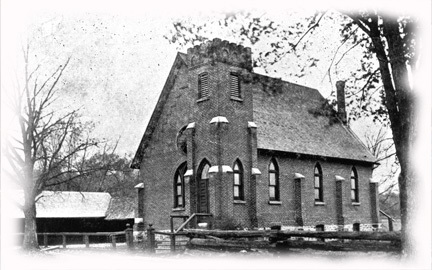 The beginnings of the Wesley United Church go back to the early days of settlement in the former Township of Medonte. Prior to 1850, there were very few settlers in the valley of the Coldwater River. The majority of the settlers were English and Irish with a sprinkling of Scottish. The first church, which was a wood frame building, was located along the Coldwater River between Highway 12 and Moonstone. In 1898 the original church was replaced with a new church at the same site. The present fine brick church, picturesquely located and set within a beautiful churchyard on the banks of the Coldwater River, is a memorial to the faith, devotion and courage of the Methodist people of this the Eady community of 100 plus years ago. In 1987 an addition was built on the west side. The addition houses a nursery and updated kitchen area on the lower level and the new Wesley Room on the main floor for meetings, coffee hour, etc. From 1885-1918 Ministers served five congregations: North River, Fesserton, Coldwater, Eady and Waubaushene. Events at a Glance !